Blog Talk - 5 Tips To Deal With Blogger FOMO | La Petite Noob | A Toronto-Based Fashion and Lifestyle Blog. We've all been there - you're casually scrolling through your Instagram feed and are bombarded with dazzling images of fellow bloggers jet setting to exotic vacations, attending dazzling events, and modelling high-end designer duds. You would have to have a resolve made of steel to not experience a little FOMO - fear of missing out. In an age where we're able a curate a wonderful picture of our lives through the magic of social media, it seems as though you just can't escape the pangs of jealousy that inevitably come along with being active online. As bloggers, we're constantly interacting with one another online - and are highly aware of what each other are doing. I can personally admit that I've been at home in my PJs scrolling through my Instagram feed and wallowing in a self-pity party as I stare at photos of girls and guys who seem to have a much more exciting life than I have - FOMO is real! To deal with the blogger FOMO I've been practicing these 5 tips that help to dissolve feelings of jealousy and bring me back down to earth. Call is self-destructive, but why does it seem like the easiest - and most obvious - way to deal with online envy is often the hardest. As much as I crave to track blogger x's next move on a fabulous vacation via social media, the healthiest thing to do is to unplug and step away from the Internet and do something productive. I like to tidy up, walk Fritz, start reading a good book - anything to keep my attention long enough to avoid the temptation of looking at the screen. By taking any energy you would spend on your FOMO and using it towards something productive, you'll be distracted long enough to forget about your blogger envy and be left with feelings of satisfaction from getting a task done. It's so easy to lose track of the fact that everyone is projecting the very best image of themselves through social media, and there's the inevitable mediocrity that comes along with life that doesn't get staged and posted. The best way to get a reality check is to scroll through your own feed - looks pretty good, right? I know that I certainly am not posting the fact that I ate cereal for dinner three nights in a row - but will definitely post when I'm out having dinner on a chic patio. Use yourself as the example. and trust that the bloggers giving you the FOMO aren't tracking the less glamorous aspects of their own lives either. One of my favourite big-time bloggers Kayla from Not Your Standard just wrote a beautiful post addressing this very issue here. This is specifically for that pesky FOMO that comes from following bloggers that live in world-class destinations - I'm talking your Manhattanite, Californian, European bloggers who seem to have a never ending supply of post-card like photos that fill your feed. The best way to stop coveting a metropolitan hometown is to get out, explore and own your city. Does your town have a picturesque park, a cute coffee shop, or a colourful florist? Embrace it! Once you start viewing your own city as a destination you won't even be phased by the location shots in your feed. Sometimes it seems like everyone and their Grandmother are out at media events, socializing at trendy hot-spots, brunching on patios, etcetera, etcetera. Instead of wondering if your invite got lost in the mail, why not create your own event? Try reaching out to some local bloggers in your area that you've connected with through the blogosphere or social media and rally everyone together. The meet up doesn't need to be formal - even a casual happy hour or afternoon latte to talk shop can be just what the doctor ordered to cure FOMO! Taking the first tip a little further, channeling that jealous FOMO energy and throwing it back into your own blog or project is sometimes just the push that you need to get your head in the game. There's nothing wrong with a little healthy competition - even if it's completely one sided on your part. Plan out your blogging editorial calendar, make a list of potential blog posts, research, strategize - get hungry. Taking any energy that would be expelled on jealous feelings and pouring it back into your own blog can spark your creative and strategic brain, and has the potential to yield huge results! What do you guys think? 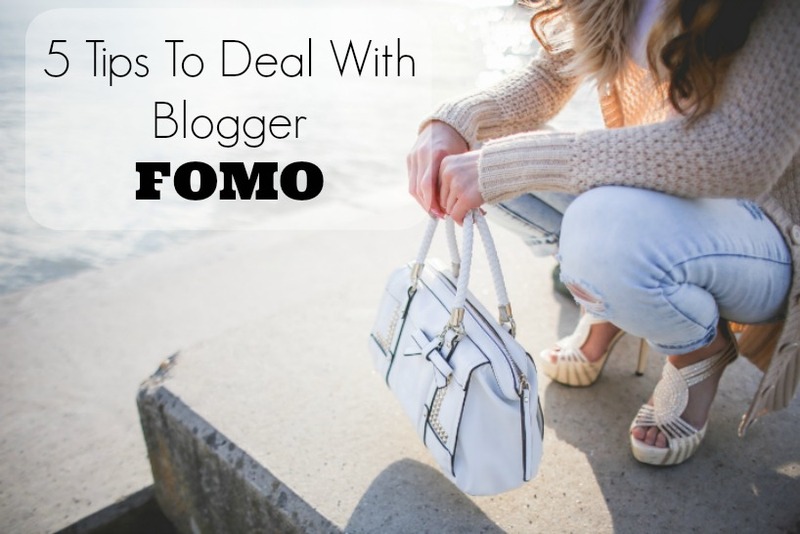 Is Blogger FOMO real, do you experience it? If so, how do you manage it? I would love for you to join the discussion! Love this post! It's real and we all deal with it! Still need to plan our blogger brunch! YES! I know we keep saying this, but we really all need to get this brunch going! I'll send out an e-mail and we can make it happen! This happens to me nearly every time I scroll through my IG feed. The most intense occasions are when I'm at work taking 20 minutes to eat my lunch and scroll through social media at the same time, and envying all the full-time bloggers! I especially like tip #3, I firmly believe in being a tourist in your hometown! Ohhh, I totally know what you mean. It can be so hard to follow full-time bloggers when you work full time - I'm right there with you! I'm glad that you're also an advocate for being a tourist in your home town! I LOVE #3 Embrace your own! These are all awesome tips to slip away from FOMO, it's really nice to hear how you're so real through your blog. You've sucked me in right from day one! Thank you so much Karen, I really appreciate your thoughtful comment. I'm grateful that you found my blog, and for your support! Great post! I'm from North of Toronto, and sometimes it can be difficult to find photo-worthy spots when it comes to blogging. Just gotta make something of what you have! So true Brenda! When I was living by the lake, outside of Toronto, I always struggled with finding different spots to take photos in. The one thing I took for granted though - no people! It's so nice to not have to fight a crowd to take photos! They're good tips - it's definitely hard to avoid comparing your life to the lives of jet-setting bloggers when you spend most of your time watching videos and reading blog posts. So true about looking at your own feed - we only ever show what we want others to see and the same definitely goes for them! It's so true, it's such a vicious cycle - I'm also guilty of failing into the Vlog FOMO trap. I'm glad that you like the tips! I'm so glad that you found this helpful Chloe! I'm sure there's a ton of beautiful spots in your town! OMG I love this post! Blogger FOMO is sooo real. Everybody seems to be jetting off exactly when I'm at home doing nothing very exciting! Great point about looking at your own feed - yours is the kind that makes me jealous so you definitely don't come across boring :) Sometimes it's easy to think that all these bloggers are getting handed opportunities on a plate too, when in actual fact they're probably reaching out to companies and asking for them. Thank you so much Lily, that is so sweet of you to say - I'm glad that you keep reading! I've tried the whole 'editorial look' thing, and I honestly just look like a crazy person doing it! I agree with you though, I think many bloggers reach out to companies instead of having opportunity falling in their lap - more than they care to admit!